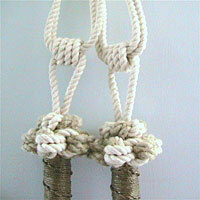 These knotted hoop towel holders feature the decorative ropework technique known as a grapevine service, and were made as a special order. At sea, a service on a rope or ring would protect against chafing. A 3mm cord was worked around a solid ring with a netting needle, creating a spiral effect. The two rope worked hoop towel rails measured approximately 14cm each in diameter. 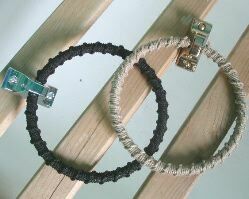 One used a natural fibre hemp cord as a decorative hitching, the other was finished in black polypropylene 3mm cord. This design features as an ending for a curtain tie-back made from large diameter rope. based on a traditional type with loops or rings at the ends to fix onto existing tieback hooks set in the wall. 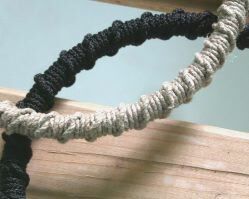 The decorative loop ending could be used in any situation where a large diameter rope needs to be finished with a thinner one. Making a secure join between two very different thicknesses of rope (ie. the main body of the tieback to the loop) presents quite a challenge. All the solutions involve some elaborate knotwork and a lot of patience. 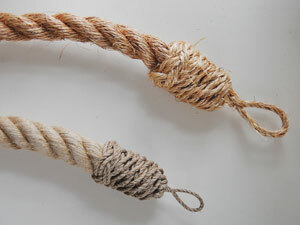 This image shows two decorative rope loop endings on curtain tiebacks; the higher one made with a 18mm diameter manila rope and the lower one from 24mm diameter hemp. A continiuous crown plaiting in 6mm manila cord and 3mm flax respectively, forms an end cap for the rope. Each is finished with a turks head whipping at the base. The cotton 24mm tie-back above shows the end cap made using the strands following out from the eyesplice at the top in 8mm diameter rope. The larger diameter rope is first whipped. The strands of the unlaid 8mm rope are tucked and sewn through the lay of the 24mm rope on the other side of the whipping, to secure the cap to the main body. These strands are then crown plaited back up around the thicker rope towards the loop, and finished with a double crown knot at he base of the eye-splice. A complete item is shown in 24mm hemp. Shown here is a version of the loop-ended 24mm rope curtain tie-back in situ: this one was made from a pale natural-coloured p.o.s.h. (very high quality spun polyester) with a few decorative tassels added along the way. Another ending for a rope tie-back is a brass or chromed barrier rope fitting which can be attached to the ends of a short rope and used in the same way. On the barrier rope page you can see a traditional method we use to secure these hook ended caps to the rope. 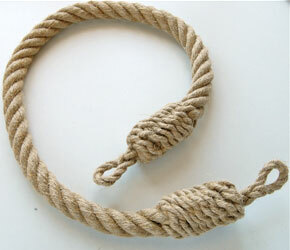 We offer various designs of rope tie-backs to order in our rope products section. 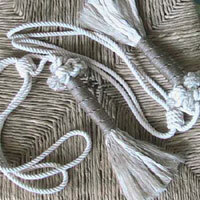 These natural fibre rope curtain tie-backs feature a sailor's button knot known as the star knot, with a tassel end. 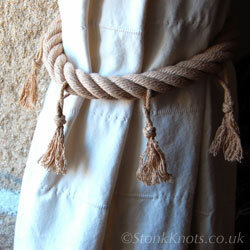 They were made using 6mm cotton and hemp cords and finished with a decorative whipping in flax twine. 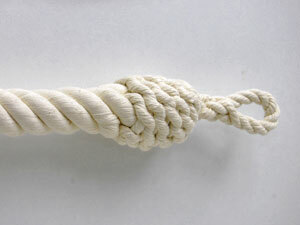 To make one tie-back, six strands of mixed natural fibre cords were used; three each of 6mm cotton and hemp. The star knot is worked by seizing the six separate strands together and making round turns in one after another, each one being led around the previously worked strand. These Star knots were topped with a Double Crown knot with all the strands neatly tucked out of sight. 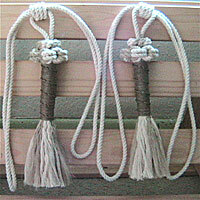 Each tassel end was spirally whipped with flax cord using a technique known as the grapevine service. The remaining tassel was then thoroughly combed out using a dog-comb, and finally all the uneven strands neatly trimmed with scissors. A smaller version of the star knot tassel using 4mm cords is available to order as a decorative lightpull on our rope products section.